Do you have the courage and determination to better your life by continuing your education? This is a cash award and recipients may use the award to offset any costs associated with their efforts to attain an education, including books, tuition, transportation, etc. The award is directed to women who, for whatever reason, find that they are lacking in the basic education of a high school diploma, or are new to Canada and must improve their English education in order to enter the workforce in their chosen field. It also targets women who find themselves lacking in the skills needed to find a better career, so want to enter a skills-training program. 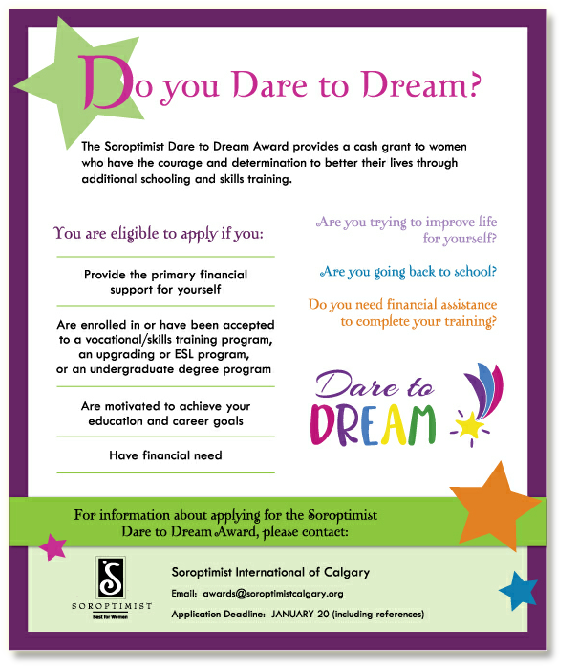 Soroptimist International of Calgary is instituting one award of $1000 as a cash award that may be used to help you attain an educational goal to better your life. Applications will be received from July 1 to January 20 of the following year. Applications will be judged and the winner will be notified by the end of February. The award will be presented at a dinner honouring all award winners of Soroptimist International of Calgary’s awards programs in April of each year. Please read all instructions carefully to ensure that your application is complete and ready for submission.